A double dissolution federal election gives added importance to this year’s May 3 budget. 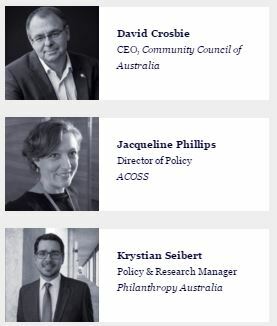 Less than 24 hours after the treasurer brings down this critical budget, Pro Bono Australia will bring you an Executive Webinar that features a three-person panel of experts from the community, philanthropy and social welfare sectors who will dissect the budget and what it means for the Not for Profit sector and you. David Crosbie has been a leader in the Australian NFP sector for more than 20 years and is currently Chief Executive Officer of the Community Council for Australia (CCA) and a member of the NFP Sector Reform Council. CCA is a membership organisation and works to strengthen the whole of the NFP sector in Australia by being an effective voice on issues shared throughout the sector. He has served on a range of key national bodies including as Chair of the National Compact Expert Advisory Group and a member of the Community Response Task Group chaired by Julia Gillard. He is involved in various national projects and initiatives including being a Jury Member of the PwC not-for-profit Transparency Awards and a board director of several not-for-profit organisations including the Foundation for Alcohol Research and Education. Krystian has broad experience in public policy development, and an in-depth awareness of government, legislative and political processes. He has particular expertise in not-for-profit sector policy and in regulatory reform.Prior to joining Philanthropy Australia, Krystian was an adviser to former Australian Assistant Treasurer, David Bradbury. In this role he was responsible for the delivery of major not-for-profit sector reforms including the passage of Australia’s first comprehensive statutory definition of charity, the Charities Act 2013, and the establishment of the Australian Charities and Not-for-profits Commission (ACNC).Krystian is a board member of Mental Health First Aid Australia, and writes a regular column for Pro Bono Australia News, where he focuses on philanthropy, public policy and research. Jacqueline Phillips joined ACOSS as the Director of Policy in August 2013. From 2010-13, she was the National Director of Australians for Native Title and Reconciliation (ANTaR), a national Aboriginal and Torres Strait Islander rights and reconciliation advocacy organisation. Jacqueline has a long history of involvement with the COSSes, having previously worked as a Policy Officer at ACOSS and the ACT Council of Social Service (ACTCOSS). She has policy expertise across a range of areas including social security, housing and homelessness, Aboriginal and Torres Strait Islander policy issues, community development, human rights and justice. Jacqueline has an Arts/ Law degree from the University of Sydney and a Masters in Law from McGill University, Canada.